I always enjoy showing you their work. design of Claire’s parent’s house! Newport Beach, California neighborhood of Bayshores. Here is the entry of the single story main house. 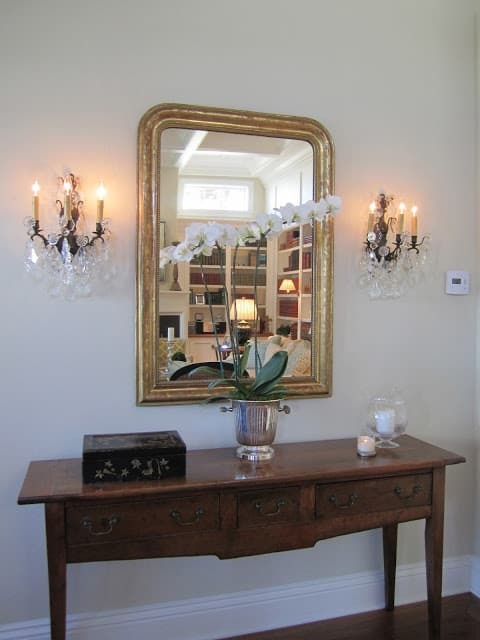 with the crystal sconces above an antique English table. Here is the comfortable but chic living room. Claire’s father’s antique book collection gives this room character. The high windows on either side of the fireplace bring in lots of light. 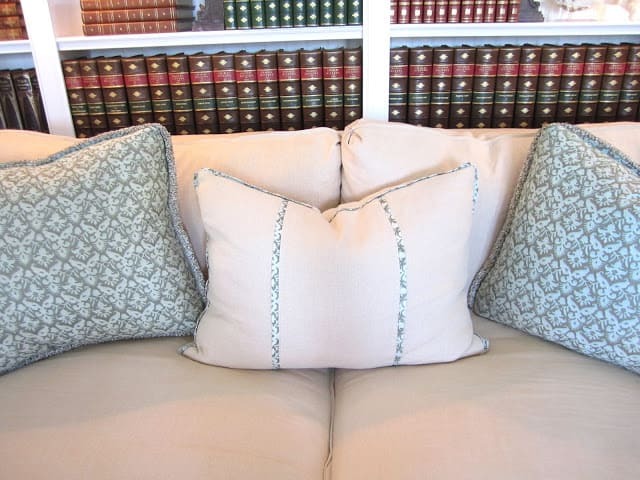 Look at the detail on these pillows. The flat welt trim on the center pillow is made from the Fortuny fabric on the two side pillows. (Note to self: steal this idea). How about this jewel of a powder room? The shell on the mirror is in keeping with the beach theme. and the mirror is from Schumacher. Kathryn’s children and grandchildren enjoy family parties here in the dining room. 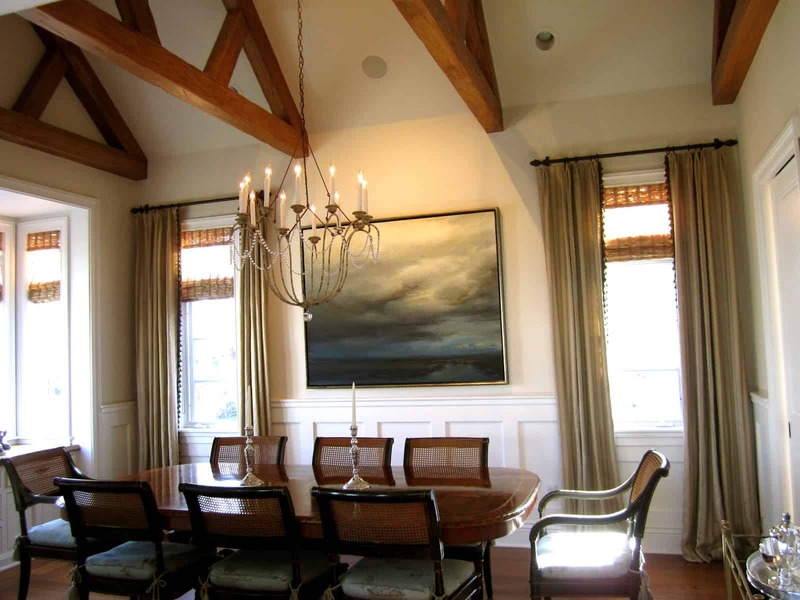 The chandelier is from Niermann Weeks and the table and chairs are from Ebanista. and trimmed drapes. The painting is by Ray Turner. This fabulous tea cart is one of Claire’s finds. 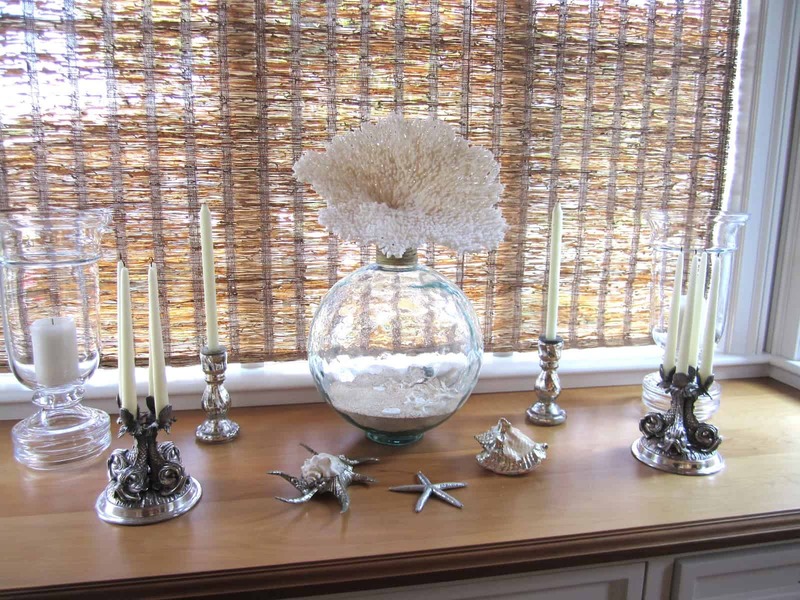 The built-in side board in the dining room must be pretty at night in the candle light. the rest of the tour soon. WHAT IS classic • casual • home ? Hi, oh my God beautiful home I love the book colletion from her dad. also the tea cart so cute! What a treat! Her home is GORGEOUS!! I'm in love with her front door! I've always wanted a door like that! Thanks so much for sharing! I've definitely gotten my swoons in for the day! 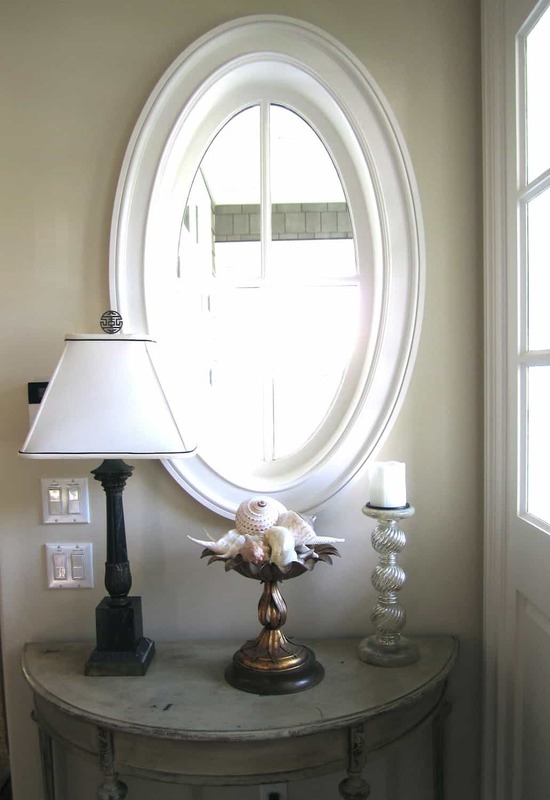 What a stunning home….love the powder room! I can't wait to see the rest :o) Thanks for taking us on a little tour! You could be a scout for a magazine!! Love it all. The full wall of shelves and books is gorgeous, well it all is. Very sweet picture too w/the homeowner at her dutch door. Gorgeous!! 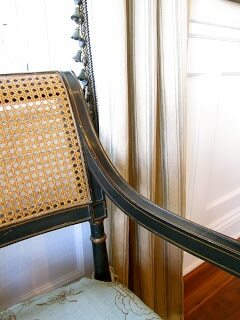 I love all the beautiful fabrics in this home! It's just lovely – thanks for sharing it, Mary Ann. What a beautiful home! I love the dutch door and that chandelier! Such an elegant home! That dining room and bar cart!! Thanks for the tour! So…so absolutely STUNNING! I want to just move right in! Talk about "Classic, Casual" style….this is it, pure perfection. I can't wait to see more. Sure would love to have them help with my home! It's such fun to tour other people's homes. Thanks for taking us inside your friend Claire's parents' house! I am in love with this house. That is the most beautiful yellow in the first image. I want the dining room and the cart, please! 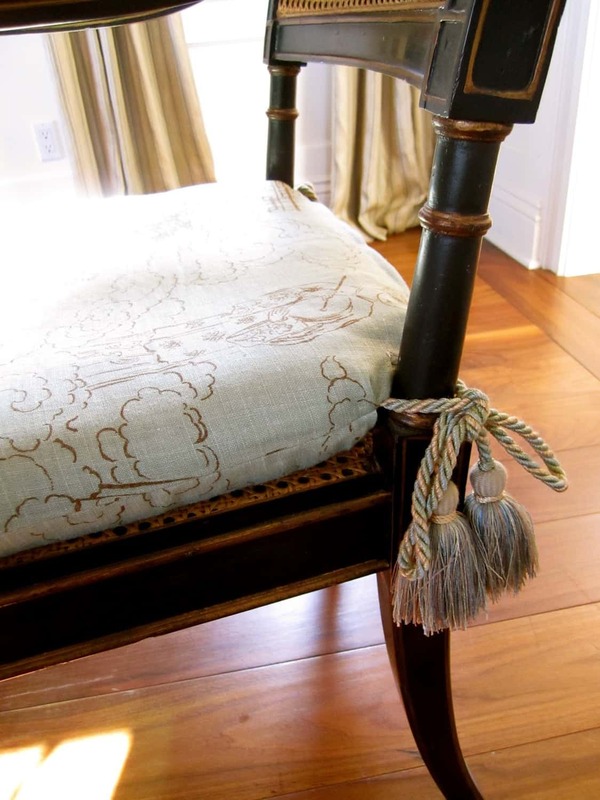 Thanks for sharing these beautiful images of the house and pillow too. Beautiful home! I love the dutch door! I love it…it is so elegant but very inviting at the same time. The front door is wonderful…and it overall has a great vibe. 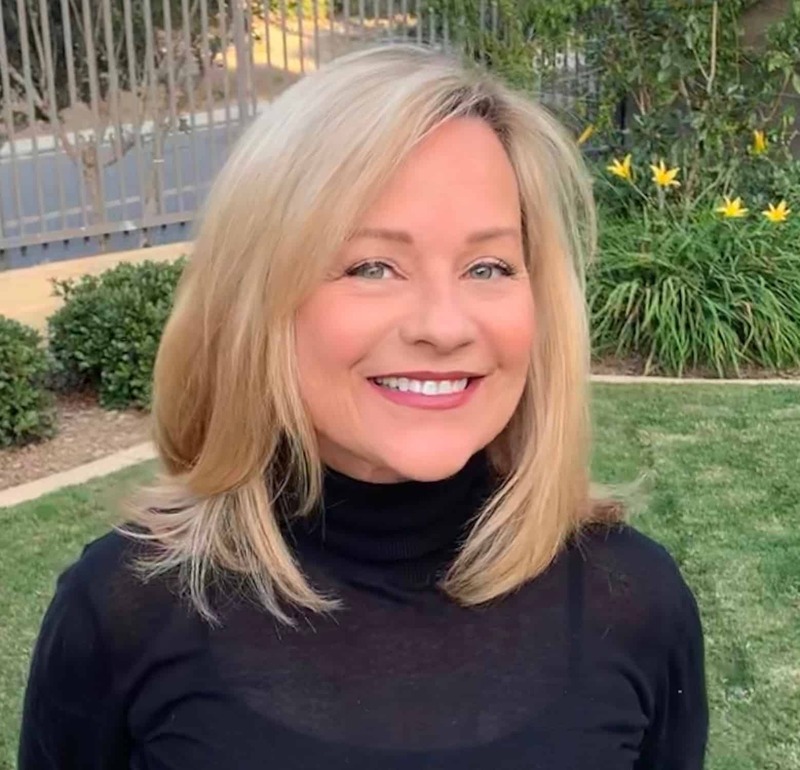 Keep bringing us these beautiful California homes, Mary Ann! 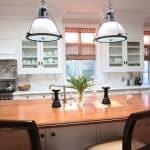 It is so tastefully done and perfect for an older couple! I love how crisp and edited everything is. What a wonderful home to spend your golden years in. Hats off to your talented friends!!! Thanks for sharing and have a wonderful weekend Mary Ann. What a lovely home! I'd never leave that living room. There's nothing more wonderful than being surrounded by books. You have the most talented friends! Have a wonderful weekend, Mary Ann! Love the the sitting room and dining room – dateless and extremely elegant. The photographs showcase the house beautifully. You had me at the dutch door and beautiful entry! 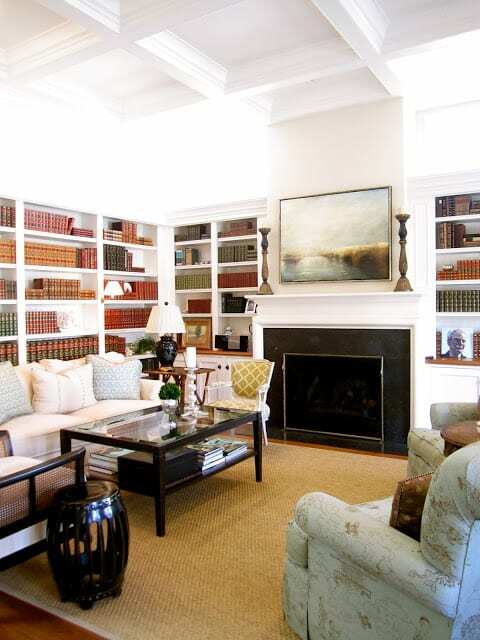 The reflection of the bookcases is a gorgeous photo, too! They've done a wonderful job putting together such a classic and inviting space! 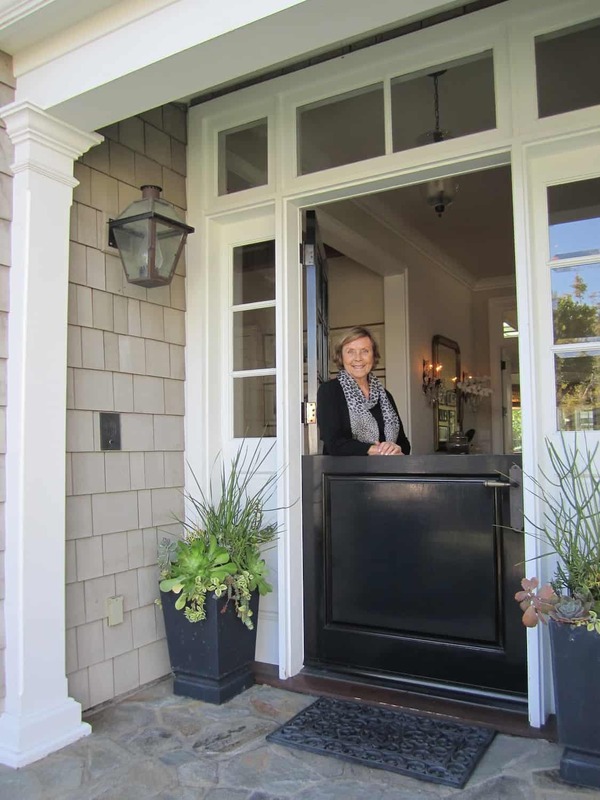 Wonderful home – I love the Dutch Door. The entire home is such a wonderful blend of comfort and classic style with some beach thrown in…. So beautiful and gorgeous! The shelves with the books remind me of our home growing up! They did such a good job. Love the collection of books and how they paid attention to details. GREAT PICS:)I really like your blog..so much nice inspiration. I love every single thing about this house. The front Dutch door is spectacular and lets a visitor know there are good things to come on the inside, too.. 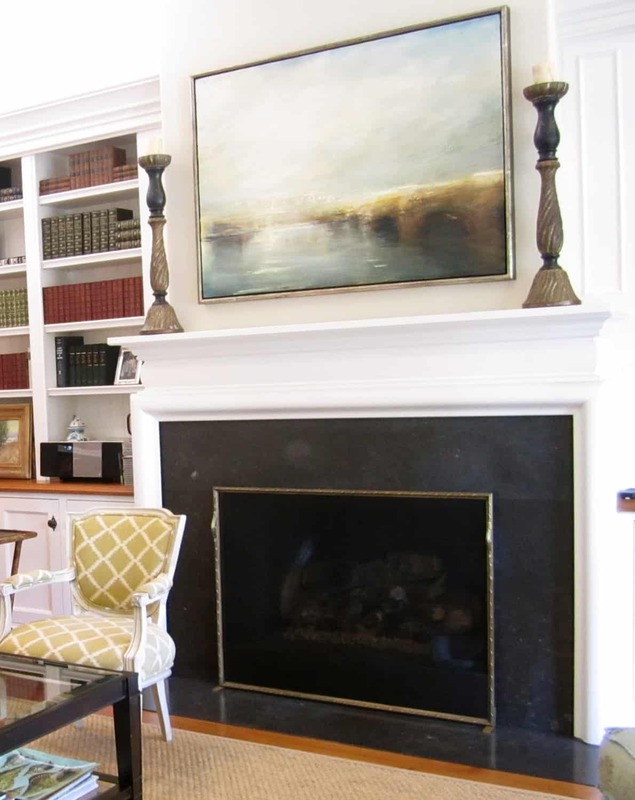 This is such a beautiful home and I love those candlesticks on the mantel in the first image. The home really shows their attention to detail. Gorgeous home! You live in a great area! Everyone's home is coastal and beautiful! 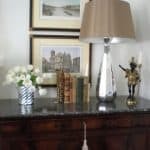 *** Soooo very lovely, Mary Ann… classic, fresh, clean and beautifully edited~~~ I think your friends, as WELL as you, have superb taste & great personal style… and I'm SOOO glad Claire's lovely parents were willing to share their FAB HOME with us!!! And FAB it IS!!! Can't wait to see what you share next!!! Again, enjoyed our lunch with Brooke~~~ it was just WONDERFUL… hope we can do it again sometime!!! Beautiful. I love the artwork in both the living and dining rooms-oh, and the tea cart, love! I can't wait to see the bedrooms and the kitchen! Please share what the pattern is for that beautiful Osborne and Little fabric chair? A must have!!!! Another gorgeous home! The antique book collection, the painting, the beams….so gorgeous!! Love the tea cart with the silver…her dutch door and entry looks so similar to mine. Can't wait to see more. 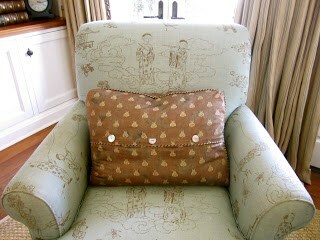 Love the wallpaper and fabric on the club chairs. Beautiful home! Wooden beams and a Dutch door, in my next life! For those who aren't familiar with the Newport Beach area where this home was built…it's a gorgeous, exclusive area. The property itself is probably valued at at least the cost of the home itself. These are very fortunate people who are reaping the fruits of their labor! Bravo! I love the understated design eye and the treasures held within! Beautiful home with outstanding attention to detail! I am in love with all of those antique books. Spectacular! Lovely home! You had me at that dutch door. 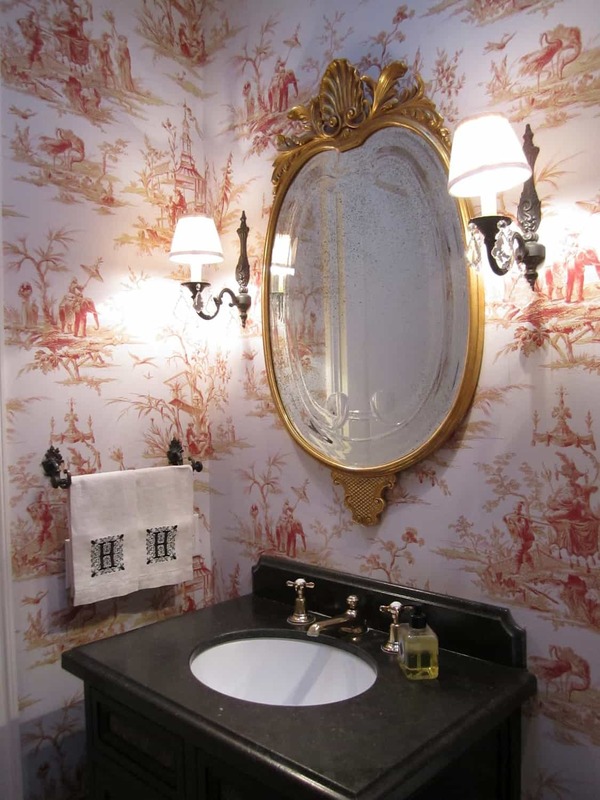 I especially love that powder room with the toile wallpaper and any project with a Niermann Weeks chandelier and Ebanista furnishings has got to be grand. Beautiful! Dutch doors are probably my favorite architectural accoutrement. Bravo! What a lovely home! 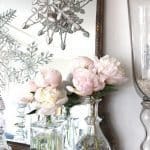 There is so much here to enjoy – the toile wallpaper in the powder room and the landscape painting in the dining room are my personal favourites! Lovely home with wonderful attention to detail. 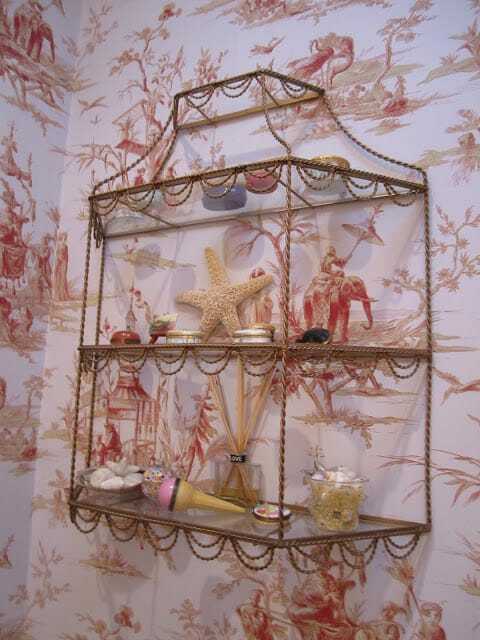 I love the toile paper in the powder room and the art work is absolutely fabulous. Spectacular! Gorgeous. There isn't a single detail of this home that I don't like. It looks comfortable AND sophisticated. Your inspiration room for your new place is one of my favourites, too. I love the mix of materials and styles.I love all of these rooms…the art is amazing and love how these rooms have it mixed with more traditional pieces in some rooms. What a beautiful home! Each room is elegant, love the details, too! Thanks for sharing! 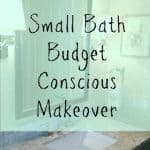 Another gorgeous house tour! Keep them coming! 😉 My favorite is the chandy in the dining room. Beautiful and elegant! Love everything, but especially that gorgeous dining room! What a fantastic home! I am in love with the door! Thanks for sharing and for stopping by my blog. I am now following you. 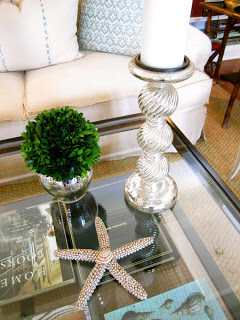 GREAT PICS:) I really like your blog..so much nice inspiration. Seriously beautiful with the most lovely of fabrics. To die for bathroom. I love seeing such great inspiration. I especially love the linen on the club chairs, how the art above the fireplace relates to the surround, and that mirror above the console table. Thanks so much for such gorgeousness. Oh, and the dutch door is killer. OMG it's absolutely perfect! Every detail, every single thing…I love it all! So comfortable and elegant. In my house, the tea cart would be called a "bar" cart 😉 but that's the only change I'd make! What a stunner that piece is! Beautiful. I LOVE the dutch door. I am going to pin that so I can dream and hopefully have one of these doors one day. In the house I grew up in we had a dutch door and I always thought it was the neatest thing. Overall everything is beautiful. What a gorgeous home – I especially loved the dront door and the artwork…what a lovely tour – thanks for sharing! Beautiful beautiful. I love these homes you share. Thanks for sharing at Wow. 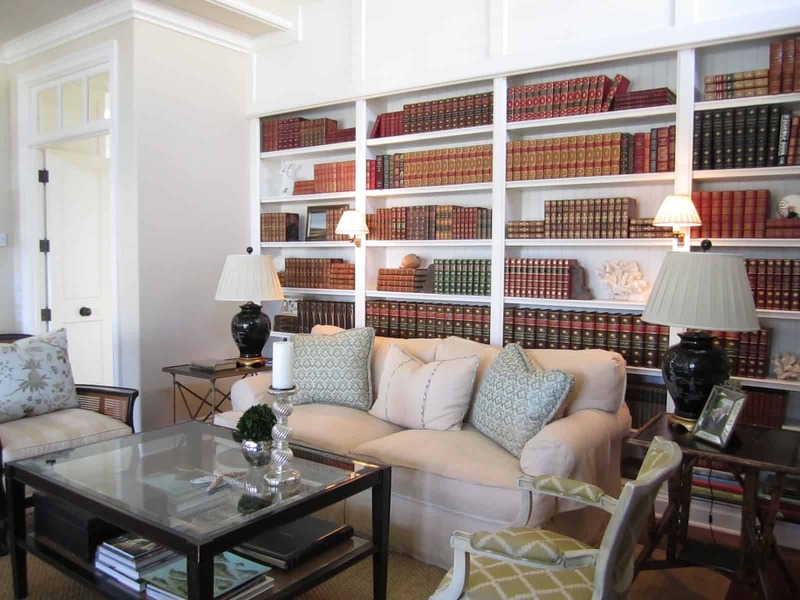 The art, the fabrics and that incredible collection of books!!! WOW. 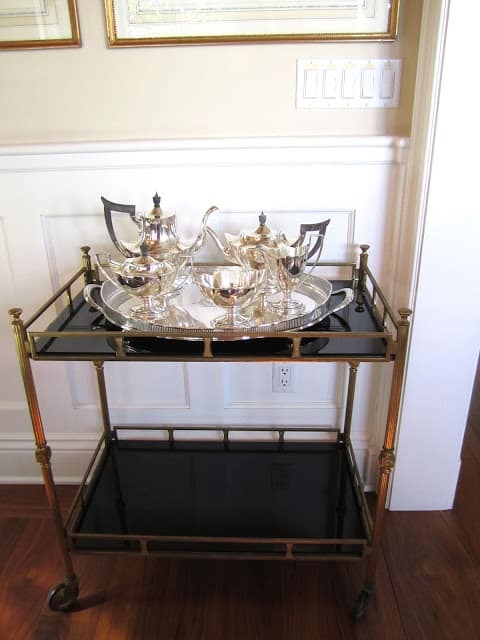 Also…that tea cart would be the envy of so many people!! !